The portrait features a young woman with a round face; the wide eyes, with iris and pupil incised, are surmounted by brushy, almost continuous eyebrows; the nose is slightly hooked, the lips tight. The wavy hair, parted at centre, is carried down at the sides, covering the ears, and tied back in a flat coil. 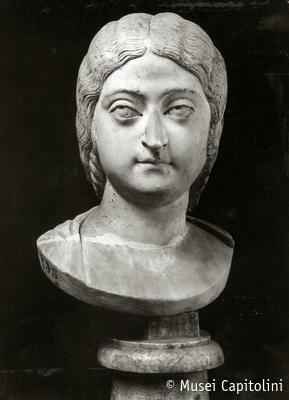 The coiffure, usually associated with empresses of the Severan dynasty such as Julia Domna, the wife of the emperor Septimius Severus, dates the portrait to the early 3rd century AD.